A set of 5 handmade, snag-free stitch markers made with glass beads and paired with gold or silver wire! They will fit up to size US 8 knitting needles, making them perfect for socks and other projects on small needles! 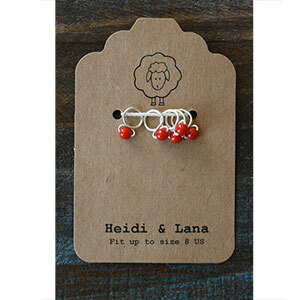 These are also a great addition to the Heidi & Lana Stitch Marker Bracelets! 5 handmade, snag-free stitch markers made with glass beads. cocoknits Maker's Keep Accessories - Triangle Stitch Markers - Extra Small and Namaste Maker's Notions - Lotus Stitch Marker Set are both similar accessories: stitch markers. Heidi and Lana Stitch Marker Necklace - Gunmetal - Namaste Teal From $18.20 to $26.00Select options on sale now! Heidi and Lana Stitch Marker Necklace - Gunmetal - Namaste Rose From $18.20 to $26.00Select options on sale now!